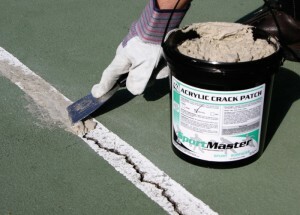 Question: Why Is The Crack Filler Not Drying On My Tennis Court? Amount of moisture in the ground, beneath the court. Pourable Crack Sealants generally contain more water to help the crack filler flow into the cracks. These can take a bit longer to set up and can be more impacted by sub-surface moisture wicking. If you are going to pressure wash the cracks before applying crack fillers, make sure to allow two or three days of dry conditions, before applying the crack sealants. Also, avoid crack filling after or immediately before heavy rains. Poor or missing drainage systems around the court can fail to move water away, and leave saturated ground under the court. This can contribute to crack filler drying problems. Trowel grade crack fillers, like SportMaster Acrylic Crack Patch, are high in solids, tend to dry quicker, and have more body to fill larger cracks. This product would dry quicker in comparison to a pourable crack sealant. Acrylic Patch Binder is mixed on-site with sand and portland cement, and would also be a great choice for a faster-drying tennis court crack filler.